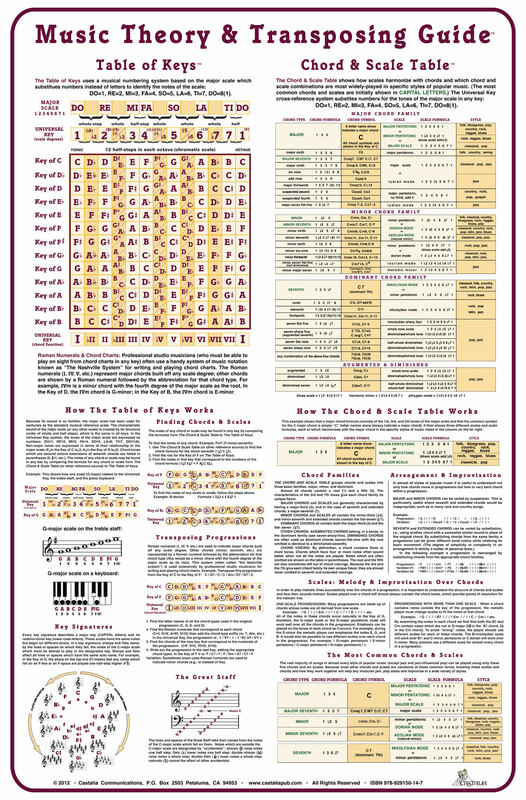 The Music Theory & Transposing Poster is a handsome reference chart that makes teaching and using music theory as easy as DO-RE-MI. The poster is designed for musicians, music teachers, arrangers, songwriters, band leaders, choir directors–anyone with an interest in understanding the principles of harmony and how it works when playing music. Music educators at last have a complete, easy-to-understand reference for music theory that will help their students comprehend the basics of the physics of music apply what they have learned. This new poster is a must for every grade school through college school music room as well as for any teaching, recording, and rehearsal studio. In addition to fundamentals such as Key Signatures, the Circle of Fifths, and the Great Staff, the poster shows, in easy-to-understand graphics, how harmony works. Castalia’s famous Table of Keys and Chord and Scale Table use a system of numbers based on the tones of the major scale (DO-RE-MI=1-3-5 etc.) to represent the notes of scales and chords (the Universal Key). The system shows the notes for all chords and scales as well as which scales are commonly played with which chords to get the characteristic “sounds” of all styles of popular music, from classical to rock, county, blues, Latin, folk, pop, and jazz.